A must in any bathroom, the cabinetry and countertop of this room were replaced to bring new life to the space. The new cabinetry in the space was raised to a taller height, and new 5” chrome hardware was installed to replace existing gold features to help complement the neutral theme of the room. Along with the taller cabinets, a 4×12 white ceramic countertop in Caesarstone Quartz Blizzard was installed to add even more style and value to the space. A new medicine cabinet was also added to the side wall of the bathroom to add extra storage in a sleek, on-trend manner. Tying together with the neutral countertop and hardware, chrome plumbing fixtures added an extra layer of luxury to the space while further supporting the overall theme of the room. Plus, thanks to the chrome finish of the Delta Dryden Collection used, the fixtures will never date the room. A simple touch to add to the space, even the neutral wall color of the bathroom helps to accentuate this trending design aesthetic. Inexpensive to change should the homeowner ever choose to, this gray wall color blends effortlessly with the white of the tile, creating a balanced and beautiful bathroom. Along with new countertops, plumbing fixtures, and more, this bathroom design is made complete with additional accessories. From rugs to towels to even wall art, this neutral theme gives endless options for finishing touches that can either blend together with the trend itself, or stand out as bold accent pieces. 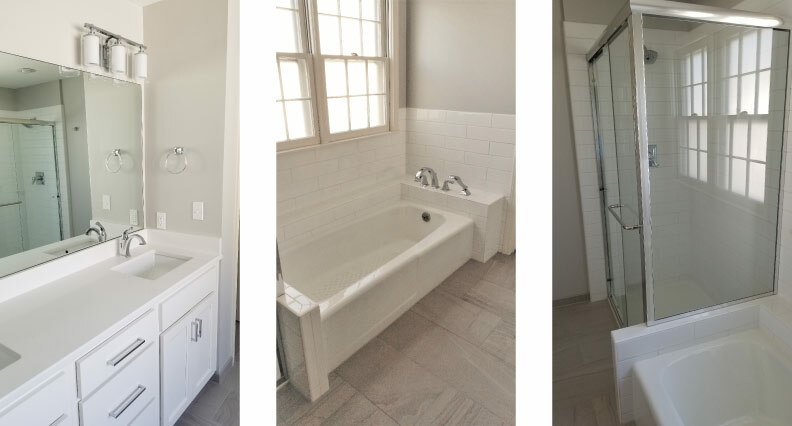 To learn more about this remodel or to make the most of your own bathroom design, contact Mission Kitchen and Bath today.